Get an intimate, candid look at the fun girls of new K-pop girl group April! In this fun reality series, the six members of April show off their distinct personalities as they face a number of fun challenges! The group is considered a sister group to KARA, and the members include So Min (August 22, 1996), Chae Won (November 8, 1997), Hyun Joo (February 5, 1998), Na Eun (May 5, 1999), Ye Na (May 22, 2000) and Jin Sol (December 4, 2001). The girls face tough challenges at a Marine Corps military camp, must spend a night in a scary house in Gangwon province, go bungee jumping at terrifying heights and participate in a cooking contest! Find out how these girls fare in these tough physical challenges! 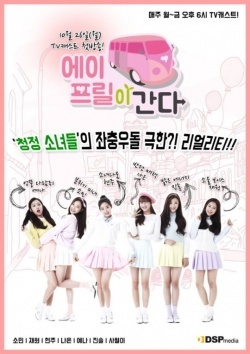 “Here Goes April!” is a 2015 South Korean reality show.